Found in the Accoutrements, Mug, Polynesian Pop, and Tiki Collections. 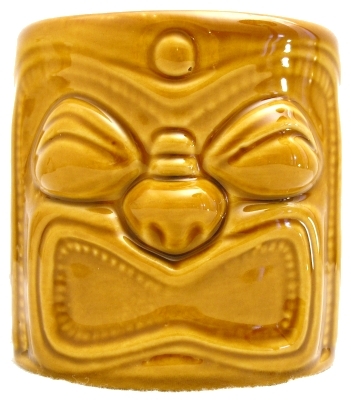 This glazed ceramic Tiki mug, known as the Big Mouth Big Kahuna, came as a part of a set of four different mugs sold by Accoutrements. On the bottom of the mug is imprinted “Accoutrements © 2002″ and “China”. 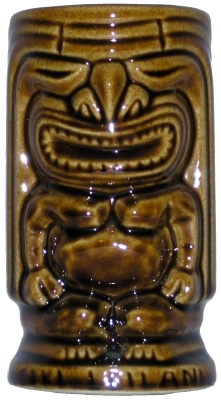 This glazed ceramic Tiki mug, known as the Big Mouth Big Kaumaha, came as a part of a set of four different mugs sold by Accoutrements. On the bottom of the mug is imprinted “Accoutrements © 2002″ and “China”. 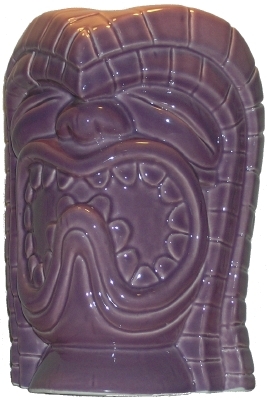 This glazed ceramic Tiki mug, known as the Big Mouth Likki Tiki, came as a part of a set of four different mugs sold by Accoutrements. On the bottom of the mug is imprinted “Accoutrements © 2002″ and “China”. 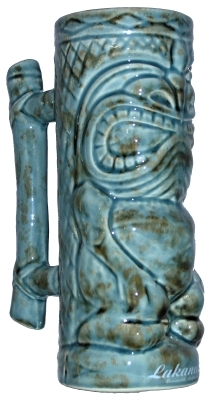 This glazed ceramic Tiki mug, known as the Big Mouth Monkey God, came as a part of a set of four different mugs sold by Accoutrements. On the bottom of the mug is imprinted “Accoutrements © 2002″ and “China”. 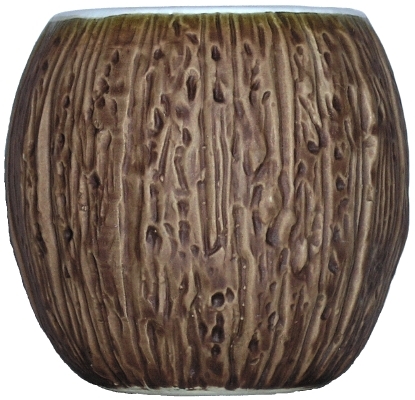 This black, 16-ounced glazed, ceramic Tiki mug, known as Carlos, is an exclusive design of Accoutrements. Imprinted on the bottom of the mug is “© 2004 Accoutrements”, and “China”. 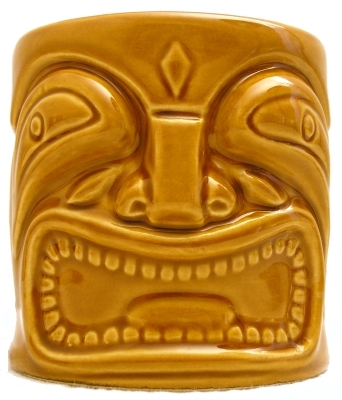 This grreen, 10-ounce glazed ceramic Tiki mug, known as Jake, originally came in a set of four different mugs sold by Accoutrements. Imprinted on the bottom of the mug is “Accoutrements © 2001″, and “China”. 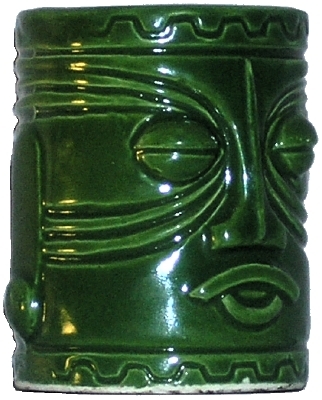 This green, 16-ounced glazed, ceramic Tiki mug, known as Klaus, is an exclusive design of Accoutrements. Imprinted on the bottom of the mug is “© 2004 Accoutrements”, and “China”. 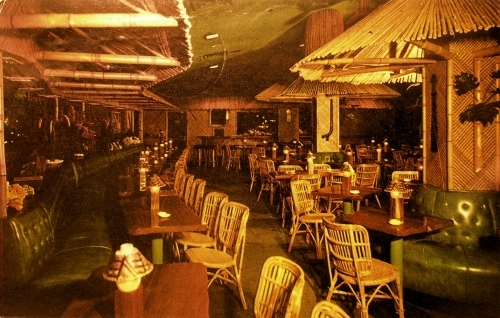 The Bali Hai Supper Club was a Polynesian-themed restaurant in Maplewood, MN. The Bali Hai Supper Club had pu pu platters, volcano bowls, and a Polynesian dance show. 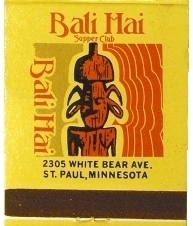 The Bali Hai Supper Club opened in 1976 by Ping and Pat Chan and closed in 2000. It was subsequently demolished and replaced with a strip mall. 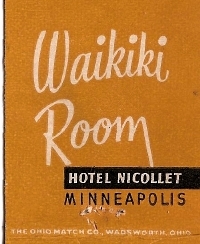 Found in the Labeled, Matchbook, Polynesian Pop, Tiki, and Twin Cities Collections. 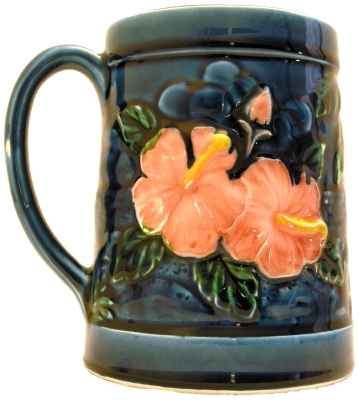 This unmarked brown Headhunter mug is similar to the Orchids of Hawaii R-1 Headhunter mug. Found in the Mug, Polynesian Pop, and Tiki Collections. This unmarked brown Ku mug is similar to the Orchids of Hawaii R-74 Tiki mug. 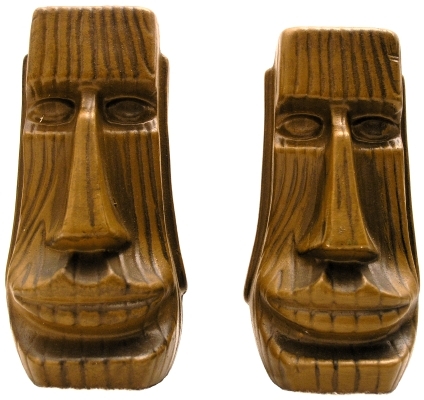 Tiki mugs similar to this can be found on page 15 of Tiki Quest - Collecting the Exotic Past by Duke Carter. 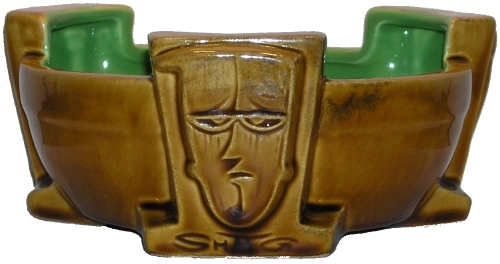 This unmarked brown Moai mug is similar to the Orchids of Hawaii R-72 Easter Island mug and the Dynasty Wholesale DW128 Easter Islander mug. 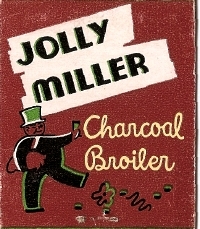 This matchbook is from Curly’s Beachcomber Room. 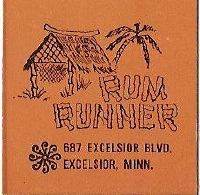 On the front outside cover is printed “Famous Steaks and Finest Liquors”, “The Fun Spot of Minneapolis”, “Curly’s”, “20 South 5th Street”, and “Between Nicollet and Hennepin.” On the back outside cover is “Curly’s Beachcomber Room” and “Famous for Steaks” against a backdrop featuring a grass hut and a palm tree. On the inside cover is the following “Number of Miles from Curly’s Cafe, Minneapolis, Minn To” with a listing of numerous cities and the distance to them. Don the Beachcombers was started in 1934 by Ernest Beaumont-Gantt. Beaumont-Gantt legally changed his name to Donn Beach. The Don the Beachcomber chained expanded to 16 locations before finally collapsing. One of those locations was in the Saint Paul Hilton in St Paul, MN. 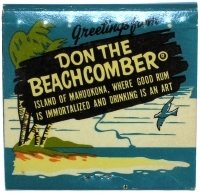 On the front cover of this matchbook is “Greetings from Don the Beachcomber” and “Island of Mahuukona, where good rum is immortalized and drinking is an art” against a tropical island backdrop. 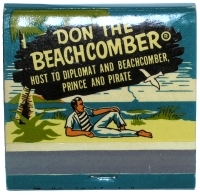 On the reverse, it reads “Don the Beachcomber” and “Host to Diplomat and Beachcomber, Prince and Pirate” against the same tropical island backdrop but with a beachcomber lounging on the beach. 1101 No. Palm Canyon Dr.
Found in the Labeled, Matchbook, Polynesian Pop, and Twin Cities Collections. 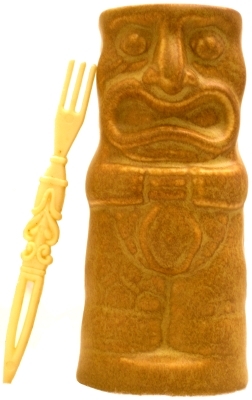 These shakers, approximately 4 inches tall and depicting smiling Moai, have no markings to indicate who the manufacturer was. 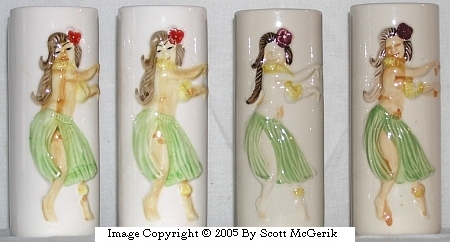 Salt and pepper shakers similar to these can be found on page 115 of Tiki Quest - Collecting the Exotic Past by Duke Carter. Found in the Polynesian Pop, Salt and Pepper Shakers, and Tiki Collections. On the back of these salt and pepper shakers is written “Florida” while on the bottom is a red and gold decal with the letters “G F” and the word “Japan”. Salt and pepper shakers similar to these can be found on page 117 of Tiki Quest - Collecting the Exotic Past by Duke Carter. This unmarked green Tiki mug is similar to the Dynasty Wholesale DW113 Green Tiki mug and the Orchids of Hawaii R5 Green Tiki mug. 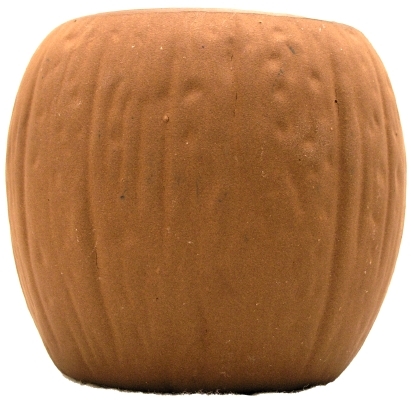 While this ceramic toothpick holder has no manufacturers marks, the simple and distinctive geometric designs in raised relief suggest it was created by Westwood. 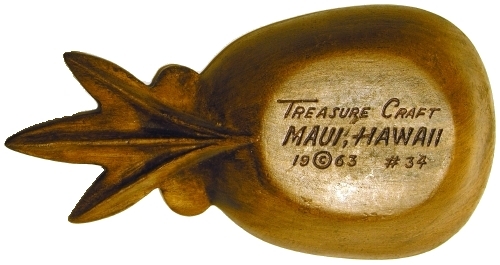 This small item originally held toothpicks or “Tiki Party Sticks”. This toothpick holder is approximately 2 inches tall and on the bottom, printed in ink, is “Japan”. 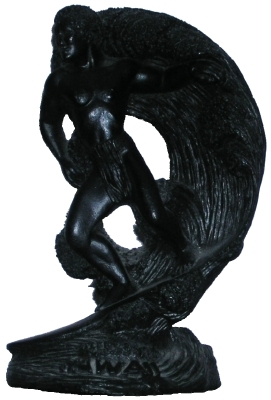 Items very similar to this can be found on page 63 of Tiki Quest - Collecting the Exotic Past by Duke Carter. Found in the Polynesian Pop, Tiki, Toothpick Holders, and Westwood Collections. I purchased this vintage, green, glazed ceramic Tiki mug from an antiques dealer who found it at an estate in Michigan. 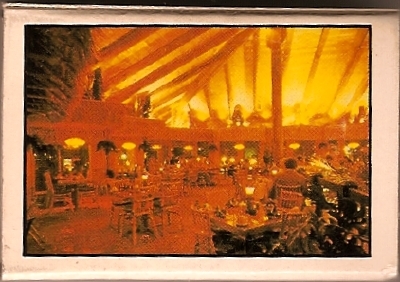 It was made by OMC for Harvey’s Sneaky Tiki Polynesian Lounge which was once part of Harvey’s Casino in Lake Tahoe, NV. 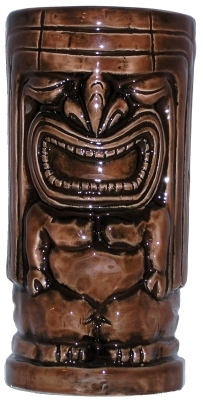 This 16-ounce mug stands 7-inches tall and features a Tiki on the front and a torch on the back. Written on the front in script is “Harvey’s” and on the back “Sneaky Tiki” and “Lake Tahoe”. On the bottom is a yellow-and-gold sticker that says “O M C” and “Japan”. 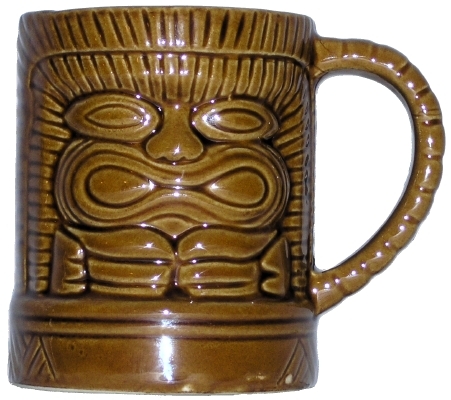 This mug is shown on page 57 of Tiki Quest - Collecting the Exotic Past by Duke Carter. 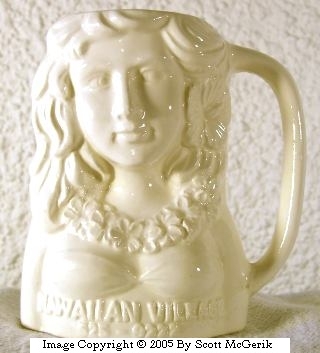 Found in the Labeled, Mug, Otagiri, Polynesian Pop, and Tiki Collections. This brown, glazed ceramic mug looks like a happy Ku. On the bottom is “KC Co Ltd” and “Hawaii”. Found in the KC Co Ltd, Mug, Polynesian Pop, and Tiki Collections. This brown, glazed ceramic mug looks like a happy Leilani. On the bottom is “KC Co Ltd” and “Hawaii”. 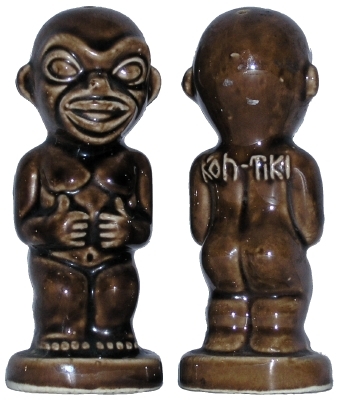 This set of Tiki salt and pepper shakers was produced by KC Co Ltd. Inscribed on the bottom is “©KC Co Ltd Hawaii”. Found in the KC Co Ltd, Polynesian Pop, Salt and Pepper Shakers, and Tiki Collections. 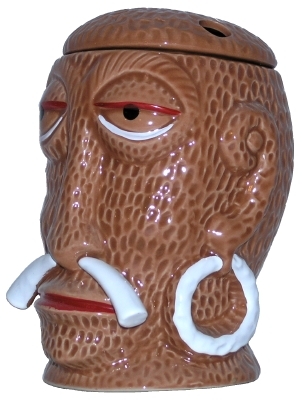 This ceramic tiki mug, produced by Libbey and called the Tonga mug, holds 24.75 ounces, is 7 1/8-inches tall and 3 1/4-inches wide. On the bottom of the mug is the imprint “Libbey®”. Found in the Libbey, Mug, Polynesian Pop, and Tiki Collections. Two variations of the brown mug. These mugs, produced by Libbey and called the Totem mugs, come in two colors kiwi (brown) and blue. I have examples of two variations of the brown color. These 20-ounce ceramic tumblers stand 7-inches tall and are 3-inches wide. On the bottom is the imprint “Libbey ®”. 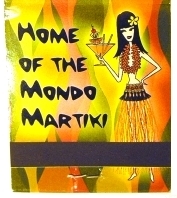 This matchbook is from the Mai Tai restaurant in Excelsior, MN. This restaurant closed in 1989 and was founded by John Logan, former head chef at the Ambassador Hotel in St. Louis Park. According to Tiki Road Trip, 2nd Ed. by James Teitelbaum, the Mai Tai was Marvel Comics kingpin Stan Lee’s favorite Tiki bar . In addition to this matchbox, I have a matchbox from the Mai Tai restaurant in Excelsior. 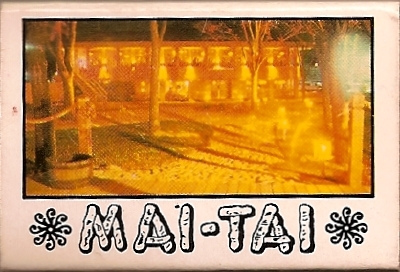 This matchbox is from the Mai Tai restaurant in Excelsior, MN. This restaurant closed in 1989 and was founded by John Logan, former head chef at the Ambassador Hotel in St. Louis Park. According to Tiki Road Trip, 2nd Ed. by James Teitelbaum, the Mai Tai was Marvel Comics kingpin Stan Lee’s favorite Tiki bar . 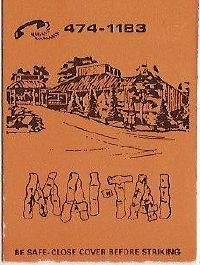 On one side is “Mai-Tai” with an outdoor picture of sand, trees, and what looks like a hotel. On the other side is a picture of the interior of the Mai Tai restaurant. It has a vaulted ceiling, bamboo chairs, Tiki statues, and other Polynesian-themed items. 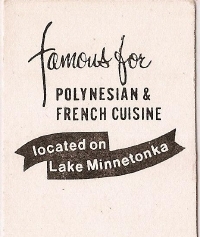 On the side of the matchbox is “687 Excelsior Blvd.”, “Excelsior, MN”, and “474-1183″. In addition to this matchbox, I have a matchbook from the Mai Tai restaurant in Excelsior. 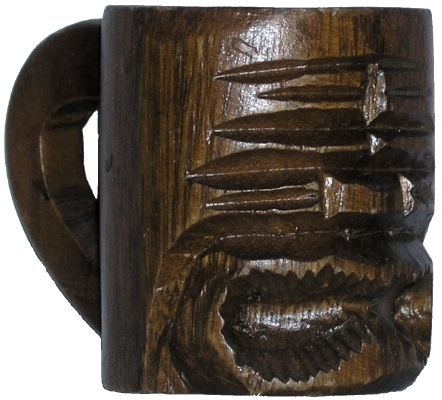 This carved monkeypod Tiki mug, depicting Ku, has no manufacturer’s marks, yet, it does not appear to be someone’s craft project. This mug is 5-inches tall and holds 14 ounces. 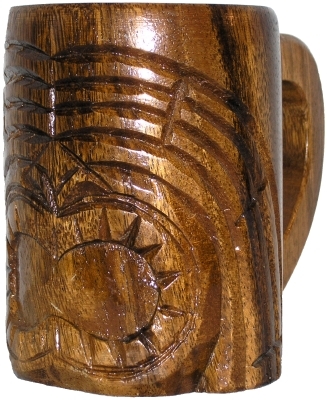 This carved monkeypod Tiki mug, depicting Ku, has no manufacturer’s marks. This mug is 2 3/4-inches tall and holds 4 ounces. 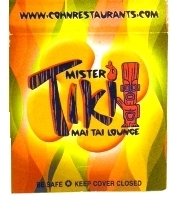 Kat and I visited the Mr Tiki Mai Tai Lounge, located in the Gaslamp District of San Diego, during the summer of 2005. I liked the Mr Tiki Mai Tai Lounge because it had a sushi bar and a sidewalk patio located at one of the busier interections in the Gaslamp District. This made for great food with great people watching. Plus, the service was good as were the drinks. 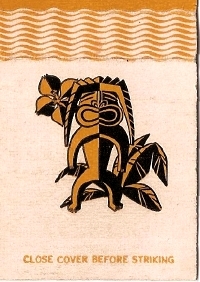 I like this matchbook because it depicts a Tiki holding a Tiki torch on one side and a wahine holding a martiki on the other. BTW, the Mondo Martiki is huge. Bring a friend or two to help you drink it. 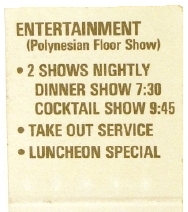 Found in the Labeled, Matchbook, Polynesian Pop, and Tiki Collections. There are no markings on this multicolored ceramic Tiki mug. 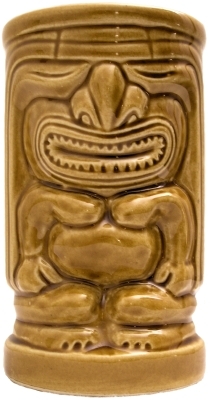 An unpainted Tiki mug similar to this, made by Jard Products, can be found on page 49 of Tiki Quest - Collecting the Exotic Past by Duke Carter. 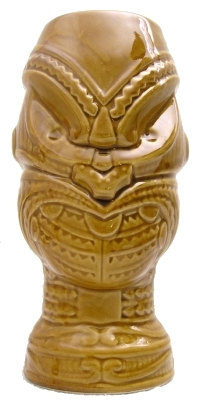 This Munktiki limited edition Tiki mug, designed by Derek Yaniger, was limited to a run of 300 mugs. My particular mug is number 156. 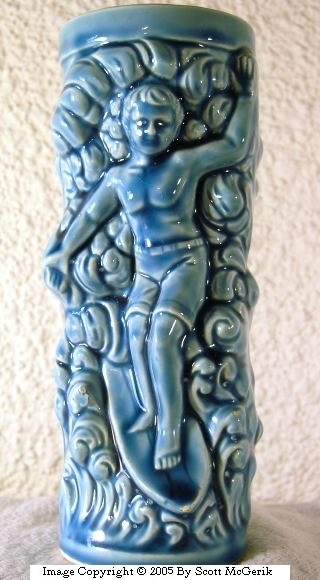 This purple-glazed mug stands approximately 6 3/4 inches tall and depicts the Hawaiian god Ku, the god of war. On the back of the mug is “Tiki News Presents Hawaii-a-Go-Go”, “Tiki Oasis 7″, and 2007″. On the bottom of the mug, it reads “Munktiki *Derek”, “Tiki Oasis 7″, “156-300″, and “© 2007″. Found in the Labeled, Mug, Munktiki, Polynesian Pop, Tiki, and Tiki Conventions Collections. Similar mugs in my collection include the Tiki Farm Mr Bali Hai mug. 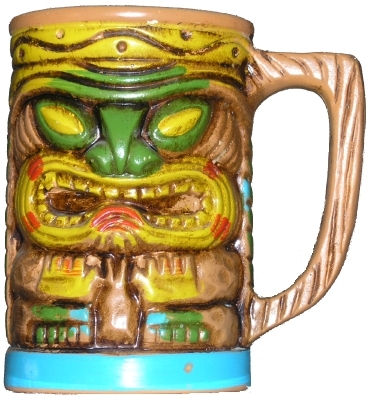 This Tiki mug can be found on page 17 of Tiki Quest - Collecting the Exotic Past by Duke Carter. Found in the Labeled, Mug, Otagiri, and Polynesian Pop Collections. This vintage mug by Otagiri is commonly called the “Peanut” mug because the texture on the back resemble that of a peanut. While particular mug is brown, the “Peanut” mug came in a variety of colors, such a tan, gray, and green. Many variations of this mug can be found with restaurant and bar names imprinted on them. On the bottom of this mug is printed “Imported by Otagiri Co”. There also is a gold-colored sticker on the bottom with “OMC” and “Japan” on it. 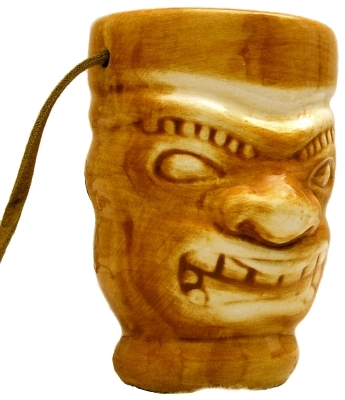 This Tiki mug can be found on page 34 of Tiki Quest - Collecting the Exotic Past by Duke Carter. Found in the Mug, Otagiri, Polynesian Pop, and Tiki Collections. 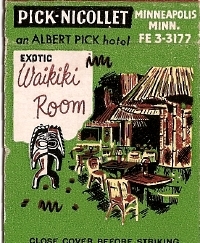 This is a matchbook cover from the Outrigger Lounge and Tropic Bowl in Rochester, MN. On the front, outside cover is printed “Outrigger Lounge”, “Dancing Entertainment Nightly”, and “Fifth Ave S.E. & Fourth St. Rochester, Minnesota” next to a Tiki. On the other side is “Tropic Bowl”, “20 Lanes”, and “Elbo Room” and a shield with crossed spears. 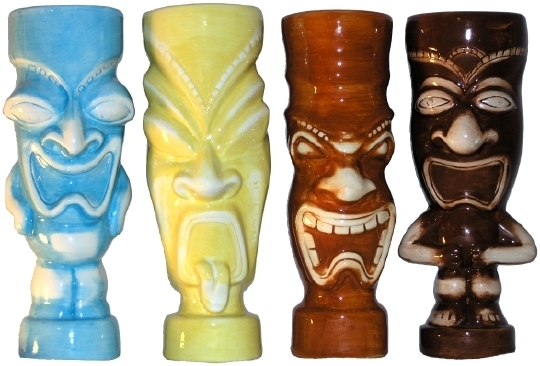 These 16 ounce glazed ceramic Tiki mugs, produced by Pony Express Creations, represent Kanaloa, Ku, Kane, and Lono, respectively. Kanaloa is God of the Ocean. Ku is Architect and Maker of War. Kane is The Creator. 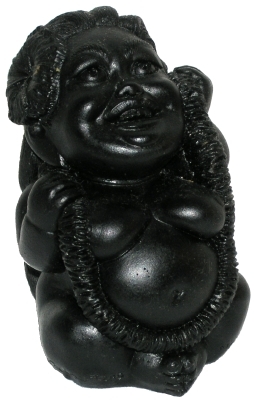 And, Lono is God of Peace and Prosperity. Found in the Mug, Polynesian Pop, Pony Express Creations, and Tiki Collections. 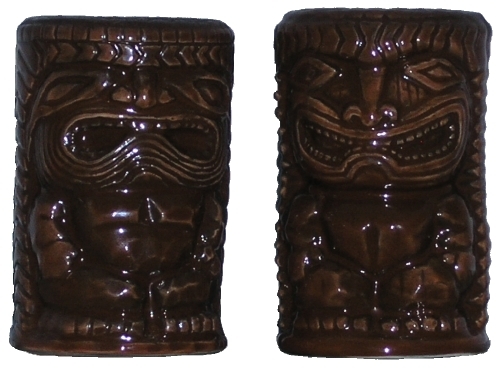 These 20 ounce glazed ceramic Tiki mugs, produced by Pony Express Creations, represent Kanaloa, Ku, Kane, and Lono, respectively. Kanaloa is God of the Ocean. Ku is Architect and Maker of War. Kane is The Creator. And, Lono is God of Peace and Prosperity. This ceramic two ounce shot glass depicts Kane, The Creator, and has a leather strap for hanging around your neck. 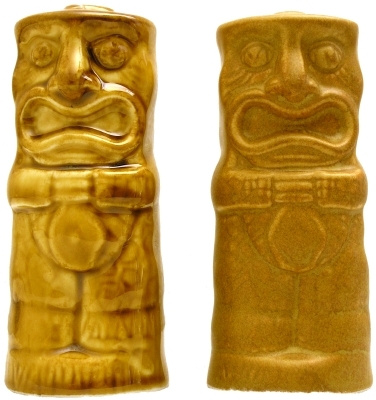 These 2 ounce glazed ceramic Tiki shotglasses, produced by Pony Express Creations, represent Kanaloa, Ku, Kane, and Lono, respectively. Kanaloa is God of the Ocean. Ku is Architect and Maker of War. Kane is The Creator. And, Lono is God of Peace and Prosperity. 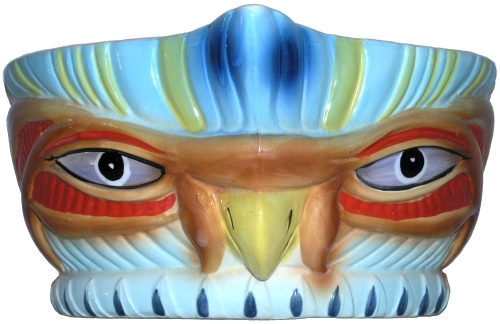 The vintage Tiki bowl, which looks like an owl, is approximately 7 inches wide and 3 3/4 inches tall. 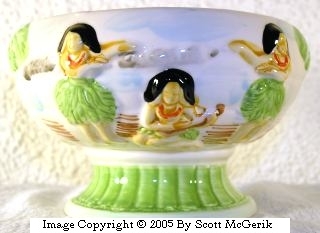 On the bottom of the Bird of Paradise bowl is inscribed “Designed by Steve Crane Associates”. 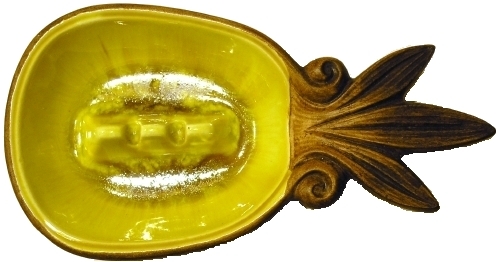 This bowl can be can be found on page 3 of Tiki Quest - Collecting the Exotic Past by Duke Carter. Found in the Bowl, Polynesian Pop, Steve Crane, and Tiki Collections. On the bottom of the shakers, it reads “Design by S Crane” and “Japan”. On the back of each is “Kon-Tiki”. Salt and pepper shakers similar to this can be found on page 116 of Tiki Quest - Collecting the Exotic Past by Duke Carter. 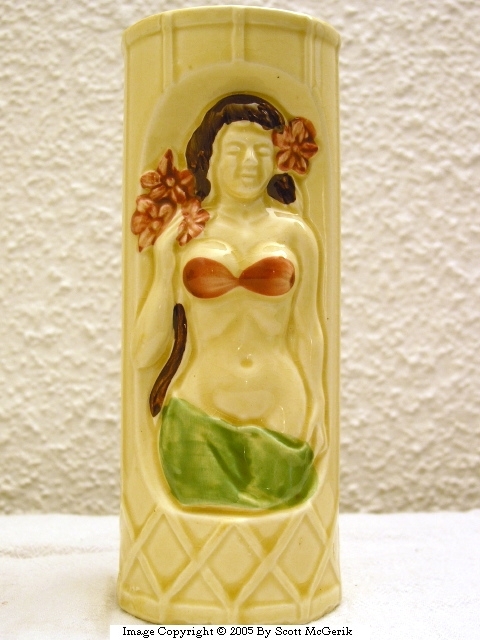 Found in the Labeled, Polynesian Pop, Salt and Pepper Shakers, Steve Crane, and Tiki Collections. The mug is a footed tall cylindrical mug with 3 Moai Sentinels flanking the perimeter. Smooth lava rim overflow transitions into a pebbled-rock style rim and a scraped backdrop with 3 potbellied grimacing Moai’s (please take note of the “outie” belly buttons). On the bottom of the mug, it reads “Limited Edition of 250″, “Tiki Farm”, and “Squid”. Found in the Mug, Polynesian Pop, Tiki, and Tiki Farm Collections. 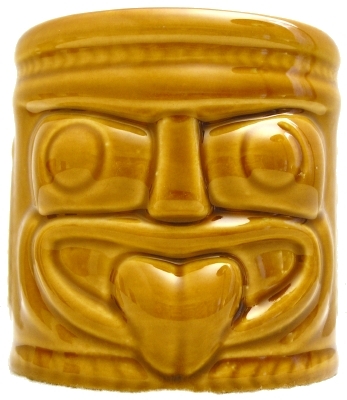 This glazed ceramic Tiki mug was produced by Tiki Farm for the Lakanuki Bar in Mammoth Lake, CA. 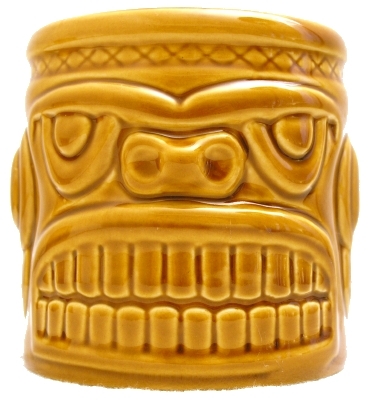 From Tiki Farm’s website, this mug features a permanent fired decal commemorating it to the Lakanuki. The total production run on this customized mug was 147 each. Found in the Labeled, Mug, Polynesian Pop, Tiki, and Tiki Farm Collections. 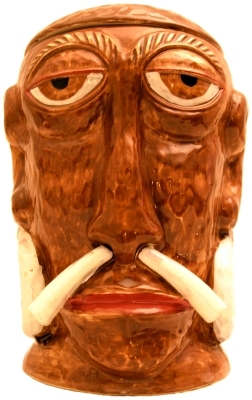 This ceramic mug, a reproduction of the original Mr. Bali Hai mug, depicts a headhunter with a bone through his nose and was produced by Tiki Farm for the Bali Hai Restaurant on Shelter Island in San Diego, CA. 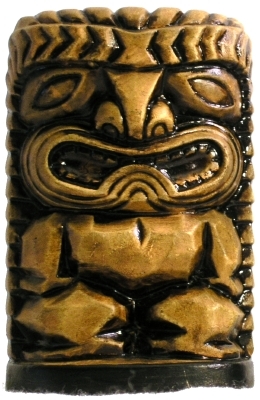 A variation of this Tiki mug can be found on page 17 of Tiki Quest - Collecting the Exotic Past by Duke Carter. 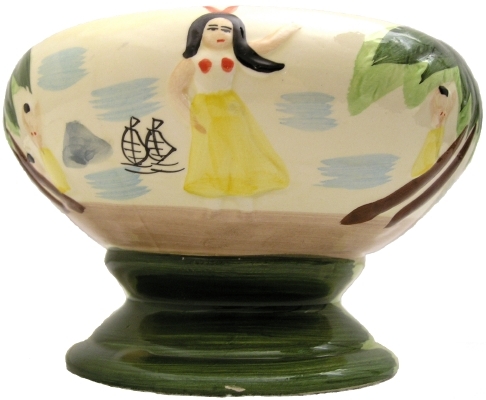 This Tres Tiki limited edition Tiki bowl, designed by Von Franco, was manufactured by Tiki Farm as part of their artist series and limited to a run of 300 bowls. My particular mug is number 34. 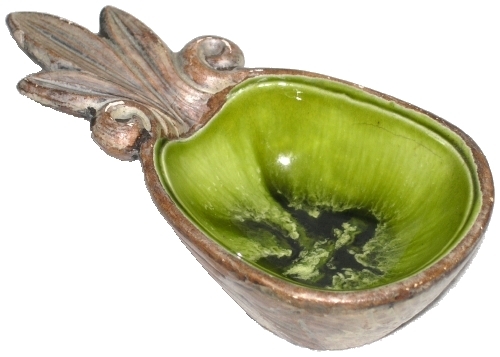 This three-footed bowl stands approximately 3 inches tall, has a brown glazed exterior and a green-glazed interior. It depicts three artists at Tikis: Von Franco, Shag, and the Pizz. Inscribed on the side of the bowl is “Von Franco”, “Shag”, and “Pizz”. On the bottom of the mug, it reads “© 2003″ and “Von Franco by Tiki Farm”. Found in the Bowl, Polynesian Pop, Tiki, and Tiki Farm Collections. 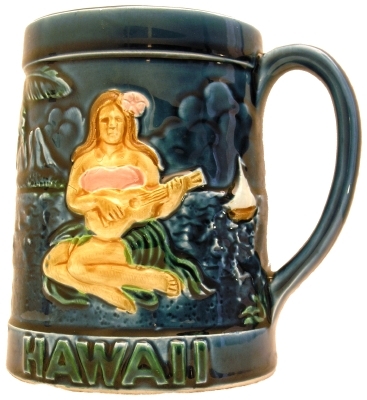 This is an example of the common Leilani mug. Thousands of these were produced by Orchids of Hawaii and sold at Tiki bars and Polynesian restaurants. This glazed ceramic mug has no manufacturers marks. 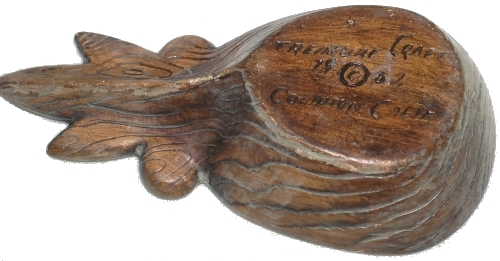 Engraved on the base is “Tiki Leilani”. Treasure Craft items similar to this one can be found on page 54 of Treasure Craft Pottery & Pottery Craft Stoneware by George A. Higby. Found in the Ashtray, Polynesian Pop, and Treasure Craft Collections. On the bottom of this dish, called a Treasure Craft Pineapple Handi-Tray, is inscribed “Treasure Craft © 1962 Compton Calif”. Found in the Polynesian Pop and Treasure Craft Collections.